Orkney haes a grand writan and publeeshan culture. 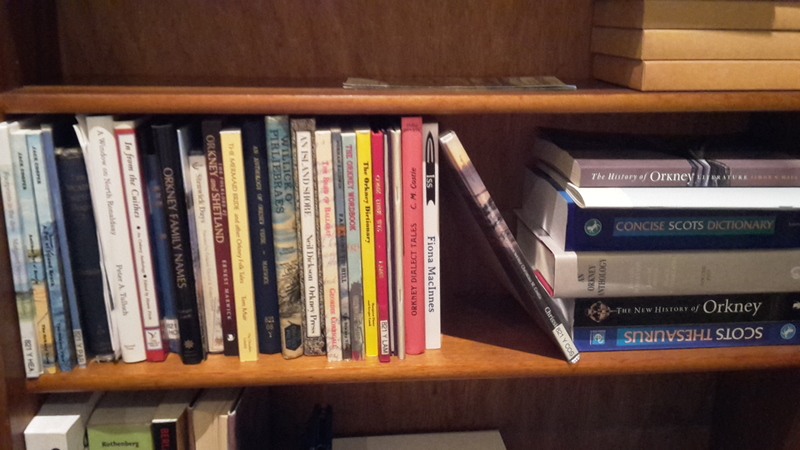 The Orcadian Bookshop‘s shelves are haevan wi Orkney beuks – local history, memoirs, novels, poetry, bairns’ beuks, photography, archaeology an a haep mair – an the Orkney Room at the Archive is fill o inspiration. Thare’s plenty o fock writan fae here an aboot here. Bit hid’s remerkable tae me at so little o hid, past an present, is wrote in the local language, especially whan the clossest comparator, Shetland, haes that rich a Shetlandic literatur, led bi Shetland ForWirds an the New Shetlander. Hou that is will hae tae bide fer anither time, bit A’d walcome yir thowts. Christina Costie an Robert Rendall are weel-kent fir thir early mid-20th century Orkney dialect poetry, an cheust recently we’ve haed twatree publeecations o contemporary poetry at cid herald a new floueran. In the years in atween, maist o the use o Orkney dialect haes been in the dialogue in local stories an reminiscences, maist affens publeeshed in the 1980s, but blydely publeeshed yet. Thare’s a peedie bit consistent an culturally-important tradeetion o comic verse forbye, wi o coorse an overlap wi the formal poetry. This is a stairtan readan list, an A’m likely left oot a haep o whit thare is. Hid’s aathing A’m foond so far at’s wrote in or aboot Orkney language or haes a peedie bit o dialect material. If yi ken o things A’m missed, A’d love tae hear aboot hid. Andersson Burnett, Linda (ed): Archipelagos: Poems from Writing the North (2014): Original contemporary poetry respondan tae the literatur o Orkney an Shetland. Includes some o the peedie bit thare is o publeeshed contemporary dialect poetry. Corrigal, G: Bard of Ballarat (1997, written early 20th C): humorous verse, mixan Orcadian and English gey fluidly. Tape recordan avaelable. Costie, CM: Wullie O’ Skippigoe: collects dialect poems previously publeeshed in Collected Poems (1974) an But-End Ballans (1949) wi new material. Gey rich an complex use o dialect. Horne, D: Songs of Orkney (early 20th C). Maistly English, some Orcadian but as a mixter-maxter wi cheneral Scots. Lamb, G: Come Thee Wiz / Nivver Spaek! (late 20th C). Humorous dialect verse. Tape recordan avaelable. MacInnes, M: Alias Isobel (2008): Contemporary dialect poetry – the only example o a fill pamphlet A ken o.
Orkney Heritage Society: Orkney Dialect Poetry Competition (2010): Contemporary dialect poetry o ivry kin. Parkins, HS: Seven year o Yule days (2002) / The long, long night (2005): Humorous dialect verse. Rendall, Robert: Collected Poems (1940-1966). Orcadian an English, maistly formal verse. His arteecle ‘The Literary Uses of Dialect’ (avaelable in An Island Shore) is an interestan entry intae the language debates o the Scots Renaissance. A’m no fully dellit intae Orkney novels tae leuk at the uses o dialect, bit A’m foond at hid’s affen no used e’en whan Orkney folk are takkin in hitoreecal novels, or cheust a wird or twa is used. A’m only foond wan geud exemple yet. As far’s A ken hid’s cheust been used in the dialogue an naebdy’s attemptit an Orcadian narration – yet. So suchestions wid be parteecularly walcome here. MacInnes, F: Iss (2014). Novel o class an identity. Muckle o the dialogue is dialect, rendered phonetically in a free-flowan non-standardised wey, an gey interestan fer hids attenteeveness tae dialect differs atween pareeshes an classes. A doot A’m missan a fair few exemples o the genre o reminiscences an stories o local life, maist usan dialect in the dialogue, an maistly publeeshed in the local paper(s) afore anthologisation. Baldwin, N: Fae Abune th’ Hill (1987). Record o local life fae a serviceman’s perspective, includan muckle dialect dialogue. Wrote pairtly wi an interest in recordan an preservan dialect, but wi ootside lugs. Campbell, H: Island Notes in War Time (1919) /nJean’s Garden and How It Grew (1927): Muckle dialect dialogue. Cooper, J: A Pot of Island Broth (1988) / Anither Pot o’ Broth (1989): Stories, reminiscences an poems, wi some dialect dialogue. Costie, CM: Collected Orkney Dialect Tales (1976): Dialect no cheust in the dialogue bit in the narration, an the richest an maist complex use o dialect A ken o.
Johnson, RT: Stenwick Days (1984) / Orcadian Nights. Humorous stories o local life includan dialect dialogue. Audiobook wi dialect spaekers avaelable. Nicol, T: Tales from Eynhallow (1992). Stories an reminiscences wi some dialect dialogue. Sinclair, D: Willick O’ Pirliebraes (1981) / Willick and the Black, Black Oil (1994). Humorous stories o local life wi muckle dialect dialogue. Stevenson Headley, M: The Voldro’s Nest (1986) / Mixter-Maxter (2006) / Footprints in the Dew (2011). Stories, reminiscences an poems, wi some dialect dialogue. Firth, H: In from the Cuithes (1995). Some dialect in the dialogue in narratives an stories. Marwick, E: An Anthology of Orkney Verse (1949). Maitly English, but wi some dialect poetry o the time an some fock poetry rendered in dialect. Marwick, E: An Orkney Anthology Vol II (2012). pp289-352 collect wird-lists an essays on dialect. Traill Dennison, W: The Orcadian Sketchbook (1880). Stories, poems an miscellany: a fouondational text o dialect literatur. Flaws, M an Lamb, G: The Orkney Dictionary (2005): Word-lists fae the Orkney Wordbook, bit includes English-tae-Orcadian section, an suchestions on grammar, spellan an pronunciation – the beginnans o a standardised Orcadian orthography. Hall, S: The History of Orkney Literature (2010): Sterkly estableeshes an analyses a canon o Orkney literatur reutit in historical an literary contexts. Lamb, G: The Orkney Wordbook (2012): Extensive word-lists wi etymolochies an usaches. Lamb, G: Orkney Family Names (2003) / Testimony of the Orkneyingar: the placenames of Orkney (1993): Extensive etymolochies fer the proper noun aspects o the language. Ljosland, Ragnhild: Chrissie’s Bodle (2011). Biography an analysis o Christina Costie, includan commentary on uses o dialect. Rendall, T: Voices Aroond the Flow (2013): Analysis o cheenging dialect in the 20th Century in the areas aroond Scapa Flow. A’m maistly left oot academic an linguistic analysis, fer thare’s that muckle o hid an thare’ll be better bibliographies than A cin pit thegeiher. Hid is vital tae understandan dialect writan, tho. Northern Lights, Northern Words: Vol. 2 of The Languages of Scotland and Ulster is a geud broad survey o the field. A’m cheust staritit tae dell intae whit’s avaelable here. The papers o J.S. Clouston, S. Cursiter, E.W. Marwick an J. Mooney aa hae dialect stories an poems, some unpubleeshed.